Charles Palmeri was the brother of my great-grandfather Angelo Palmeri. 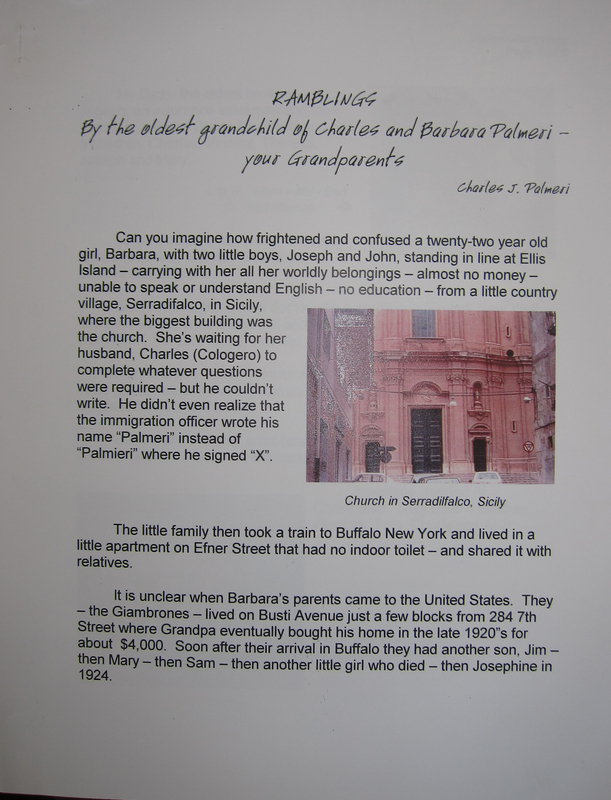 Barbara (Giambrone) Palmeri was the sister of my great-grandmother Mary (Giambrone) Palmeri. This is a story written by Charles J. Palmeri, who is the son of Joseph Palmeri who was the son of Charles and Barbara Palmeri. He is the oldest grandson of Charles and Barbara. they have recently passed .Franks Dad was also from Sicily….His Grandfather was Angelo Giambrone. Are they related at all ? I know you are a very busy person, but please send me a reply and let me know any names of relatives that are researching our Italian geneology. Is the older woman who you gave the phone no.to me still alive?